I did this profile of then-Omaha City Councilman Frank Brown in 2004 for The Reader (www.thereader.com) at a time when he was entrenched in his elected position though a frequent target of controversy. As the representative for the largely African-American District 2, a long economically depressed district with a myriad of challenges facing it, he saw himself cut from the same cloth as his idol, Nebraska state senator Ernie Chambers. As with any politician or public figure, some people liked him, some people didn’t. Some thought he was doing an effective job focusing attention and resources on his district, some thought he wasn’t doing enough. He had his loyal supporters and he had his outspoken detractors. He was the third in a short line of black District 2 council members who were elected to office after Chambers got district elections instituted. The first was Fred Conley. Then came Brenda Council, who narrowly lost a mayoral bid. For a time, it appeared Brown was untouchable in his seat on the council. The former television reporter then faced a serious challenge in 2009 when another television professional, veteran photojournalist and public affairs host Ben Gray, took him on and squeaked out a win. Brown went on to a position with an offshoot of the Omaha Housing Authority but was later forced to resign and now I’m not sure what he’s doing, though he remains a voice an dpresence in the community as host of his own public access TV show. This blog features many of my stories about North Omaha and various African-American figures and institutions here, including a profile of Ben Gray. In the coming months you can expect to see an extensive story on Ernie Chambers, the subject of a forthcoming biography by Tekla Johnson. Given its predominantly African-American demographics, any black elected representative from northeast Omaha is naturally expected to carry the torch of the civil rights struggle in addressing inner city and minority issues. Those historically consistent issues run the gamut from inadequate housing to high unemployment to poor health care to unequal representation to depressed living conditions to alleged police abuse. 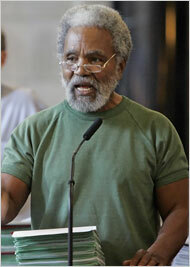 Since the mid-1960s State Sen. Ernie Chambers has been the one constant if often strident voice among state lawmakers about the plight of north Omaha’s disadvantaged residents. Other politicos have paid lip service or given short thrift to the needs and problems confronting the community, not surprising since until the start of district elections in 1981, which Chambers fought for, Omaha had no black City Council members. Since district elections began, northeast Omaha’s District 2 has had three black City Council representatives. Fred Conley, an affable businessman, and Brenda Council, an astute attorney, may have raised the profile of District 2 challenges but neither was considered the firebrand crusader many envisioned when district elections were instituted. Instead, the two were viewed as bland coalition builders with moderate agendas that steered away from controversy and confrontation. By contrast, current office holder Frank Brown, a former television news reporter, is seen as a different breed. Observers say Brown, a council member since 1997, seems unafraid to articulate the root causes of northeast Omaha’s problems and to challenge public and private leaders in seeking drastic remedies to longstanding ills. In addition to his Council position, he serves on the Omaha Housing Authority and police union boards. A Democrat, he has been a driving force on several issues: the installation of an independent public safety auditor in the wake of several police shootings that raised the black community’s ire; speeding-up work on the long delayed sewer separation project to alleviate chronic street-house flooding from north Omaha’s antiquated sewer system; and bringing Old Omaha’s widespread lead contamination problem to the forefront and making its cleanup a priority. Perhaps his most public victory — the public safety auditor — is proving a major frustration. Since being formed in 2001, support for it has withered among a majority of council members who contend it’s made little impact. In the city budget battle Brown fought to keep the auditor position alive. When the Council submitted a budget to Mayor Mike Fahey calling for its elimination, Fahey vetoed the measure, but a subsequent 5 to 4 Council vote overrode the veto. The auditor’s current $150,000 budget has been supported the past two years by private funds. Despite the City Council’s recent vote to ax the position, Mayor Fahey has pledged he will find outside funding to keep it running. Pressing the issue doesn’t guarantee victory. Brown is still at a loss for why his minority representation proposal was defeated but implies racism is at the core of the opposition. “Why are people afraid of diversity? I don’t know. People will accept money from women, minorities and poor folks, but when it comes to sitting at the same table they say no,” he said. Brown’s hard-nosed reporting background may explain his unrelenting style. “Those of us that knew Frank when he was a reporter know that he has not changed much. He still has a very dogged approach in trying to get to the truth of issues,” said Omaha police officer Marlin McClarty, president of the Brothers of the Midwest Guardians, a black police association. As a trained journalist, Brown holds the news media to a high standard. He’s been known to chew out reporters and editors when he feels they’ve distorted his stance or somehow failed to measure up in his eyes. “It really hurts me to see when something as near and dear to me like reporting is not fair,” he said. One thing he feels can’t be questioned is his dedication to north Omaha, where he grew up and still resides. However, he’s the first to say he cannot impact all the quandaries facing his district and minorities at large. To date, he’s won and lost his share of battles but even when a measure he backs is defeated or a motion he opposes is approved, his supporters admire the tenacity he shows in going down swinging. “I feel Frank is willing to put himself out there — on the spot — for what he feels is right,” said Midwest Guardians president Marlin McClarty. Long regarded as the other side of the tracks, the northeast district lost whatever economic-political clout it had in the wake of two events. The late 1960s riots there caused property damage and engendered a perception of fear that drove out many business owners and residents. Perhaps even more disruptive, the North Freeway construction in the 1970s razed hundreds of homes, in the process driving out many more residents, and imposed a daunting physical-psychological barrier that drove a wedge through the heart of a formerly unified community. The loss of people, spending power and cohesion led to the decline of North 24th Street, the traditional cultural-commercial strip that coursed with pedestrian-vehicular traffic day and night. 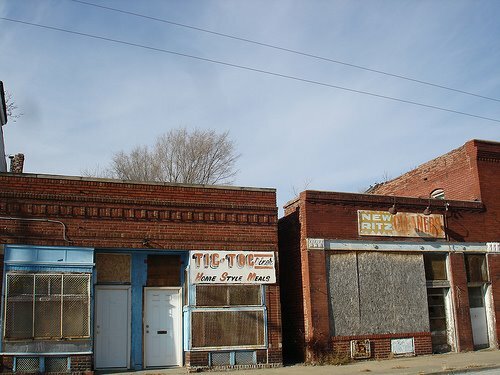 As people moved out, businesses closed and pockets of blight took hold in the form of abandoned structures and vacant lots. 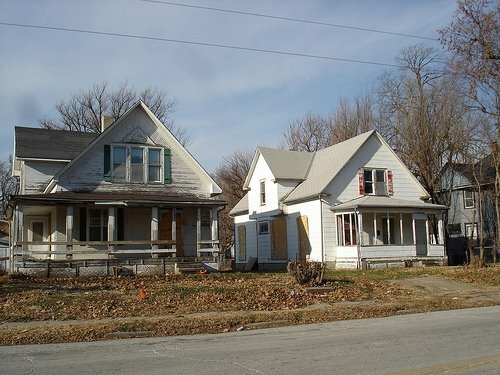 Brown said if the area is to be made attractive again to investors, more households and amenities need to be in place. He feels the only way to attract more home buyers and business owners is to increase the stock of quality affordable houses, increase the pool of decent indigenous jobs and spruce up the community. Thirty years or more have passed since the district’s decline took root and not a single comprehensive plan has surfaced to address the situation. Brown has no plan either, but he sees a need for one in an area that to date has seen sporadic redevelopment in isolated commercial-residential federal block grant-funded projects. Any assurances being made by city flaks and community leaders about the burgeoning riverfront development sparking a northeast Omaha revival is met with extreme skepticism by Brown, who demands proof he’s yet to see. That is not to say no progress has been made. New housing developments, community centers and commercial properties have sprung up in recent years in a variety of neighborhoods that heretofore saw little change for decades. There is the Fontenelle View town home project just west of the intersection of Fontenelle Boulevard and Ames Avenue. The latest project, Miami Heights, is a 24-block mixed residential-commercial development going up in the Salem Baptist Church neighborhood. A number of southern style-soul food restaurants have opened along North 16th Street and surrounding areas. But until an overarching initiative is in place that ties various redevelopment efforts into a grand, sweeping design, Brown suspects many areas in need of revitalization will remain untouched because they fall outside any targeted development zone. Last year, Brown initiated a project in the heart of his district that he hopes spurs more urban renewal. Now under construction, the North Omaha Love’s Jazz Cultural Arts and Humanities Complex is slated to be a multi-use resource center promoting the richness of black culture — past and present — via arts appreciation, education and performance. The site of the complex, 24th and Lake, is significant as it sits in the hub of a once booming cultural scene that featured many clubs and bars, including the storied Dreamland Ballroom, where such black music greats as Louis Armstrong, Count Basie, Cab Calloway and Nat King Cole performed. The area is where Omaha’s own jazz and blues legend, Preston Love, for whom the complex is named, got his start. The strip is also where Brown’s late father co-owned and operated the popular M & M Lounge, a jumping joint for night owls and the first African-American owned bar in the state. “Can North 24th Street revitalize itself? I can only hope so and I’m doing everything I can. The jazz center is a start. A lot of things have got to happen,” said Brown, who wants to see the community add to its popular Native Omaha Days homecoming celebration with an annual black expo patterned after one in Indianapolis. A longtime admirer of Chambers, who along with former State Sen. Gene Mahoney he regards as his political idols, Brown went to Chambers early on for advice.